In fact we have not seen yet those classic, in our understanding, "apples" (and pears too, but now it's not about them), that were grown in Thailand. Everything that is sold in stores and even in markets is imported from the U.S., Australia and more often from China, generously covered with wax (price from 10 to 90 baht per piece, and sold by the piece), plus some hypermarkets can have "organic" apples that can spoil quickly, costing several times higher than normal. However, this article is not about them. In this article I will tell you about the local fruits, which for some reason or due to some particlar characteristics can more or less be called "apples". ... Some of the local fruits in general are difficult to classify using familiar to us concepts and categories, and attribute them to something that we have known before, so some of those unusual types will also be discussed here, and in the course of the story I'll explain why. Let's start with the fruit, whose official name has the word "apple" in it. - Pink Thai apple or Chom-poo (in Thai). Also known by the name - Malabar plum. The shape of the fruit (pronounced almost like "Chom Phu") resembles a bell. Despite the name, rose apple may be light green, pink or even burgundy. Among these images are the "maroon apples" cut in half. Their bone is not typical of the usual Chom-poo - it is massive and round. The pulp is also different - it is almost tasteless but is much more acidic and a little tart. But in spite of a lot of differences, it does not keep them all from being relatet to species of the same Chom-poo kind. "Rose apple" is almost tasteless fruit, in the best case - slightly sweet. its thin smooth skin hides crunchy, crumbly and dry (!) rr a juicy layer of pulp, that produce a sweetish odor, similar to the scent of roses. They are eaten fresh, often with a traditional mixture of salt, sugar and pepper, same mix goes with guava, pineapple and some other Thai fruits. Also Chom-poo is used for cooking exotic dishes and desserts - making jam or jelly with lemon juice, and can it in combination with other fruits. Pink apple does not need to be cleaned inside, the fruit has almost no seeds. How to choose: the fruit must be free of nicks and black spots, firm, slightly springy when pressed. Chom-poo are very soft and have a short shelf life. - Carambola, or Star-fruit, or "star apple", or Ma-feng (in Thai). When split in half looks like a star, which explains the name. Fruit covered with a thin, shiny, translucent skin, through which you can see the yellowish-green or light yellow flesh, which when ripe becomes golden yellow. Flesh of the carambola is translucent, watery and crunchy. Good thirst quencher. Cleaning the carambola is not necessary. The fruit tastes sweet and sour ans is rich in vitamin C. The more the fruit ripe, the less acidic and more sweet it is. You can hardly call this fruit sweet even when it is ripe. Rather, it will be something between sweet and tasteless. However, with a certain development of taste buds and imagination you can say that the pulp of the fruit recalls a harmonious blend of green gooseberry, apple and cucumber. Star fruit is eaten fresh and also in the form of sugared snacks. But it is more commonly used for making beverages , salads , sauces , juices, as well as in cooking , along with lime for acidification of dishes. Be sure to try out smoothies with this fruit – a very good thirst quencher and reduces the fire of spicy dishes! How to choose: the fruit must be free of nicks and black spots, firm, slightly springy when pressed. If you need it to be more sour - take the one that is greener . These fruits can not be stored for a long time - not more than 10 days. 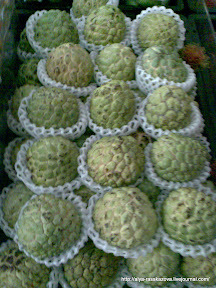 - Sugar or Custard apple or Noi-na (in Thai). With apple it has little in common. The fruit resembles a cone. Sugar apple grows on trees, very similar to our apple trees, and they have a fluffy and thick crown. The fruit is very sweet and juicy. Perfectly satisfies hunger and is great as a sweet dessert that can easily replace a piece of cake. The fruit is nearly circular, 6-10 cm long. Thick pale -green, gray- green or blue- green rind consists of convex segments. Inside the fruit is a mass of hard seeds surrounded by sweet scented milky and creamy segments with a delicious flavor and fine texture (like the pulp of very ripe pears). Each segment contains a single elongated black or dark brown seed about 1.2 cm long. The fruit may contain from 20 to 38 seeds. There are also seedless varieties, but we could not find them in Samui. If the fruit is mature enough, then the flesh can be eaten with a spoon, easily separating it from the skin. At the touch the ripe fruit is soft and the very ripe one with a bit of pressure may begin to "unravel" in your hands to the segments. The pulp is often used as the basis for the Thai ice cream. - Thai apple, or Zhuzhuba, or Chinese dates, or jujube, or Monkey apple, or Unabi , or Pudza (in Thai). Externally, this fruit is very similar to the usual apple. However, instead of the expected sourness, inside we have a fairly neutral crispy and juicy pulp surrounding a small bone, which is similar to a peach pit. The pulp is rich in natural vitamins. We used these "apples" for charlotte cake - turned out not bad. - Sapodilla, or plum-sapodilla, or Lamut (in Thai). In appearance it is very similar to kiwi, only with dark brown color and without "fur" at the surface. The form varies from elongated , extended to almost round . Peel and seeds are not to be eaten. Flesh is sugary sweet and grainy , like over ripe soft and sweet pear , rich in vitamins A and C, as well as calcium. Ripe fruit can be stored refrigerated not more than 5-7 days. Therefore, they are not exported. When choosing one, pay attention to the smell of fruit - it should not be harsh, repulsive. Skin should be whole, the fruit itself is slightly soft, slightly springy to the touch. Too hard and greenish are unripe and too soft are very ripe and are likely to have started "fermenting". You can eat only the ripe Sapodilla , mainly as a sweet dessert , lightly sprinkling pulp with lime juice. Immature Sapodilla contains tannin and milky latex that makes it almost not edible. Overripe one changes smell and taste , and also becomes unusable. But if you catch " catch the moment " , you will be pleased with the taste . Sapodilla can be eaten as a separate dessert and added to fruit salads, cakes , puddings, syrups , jams, purees and other sweets. Also it is used in cooking - add it to a ready-made curry or some other sauces (a few of minutes before it is cooked ). Fruit is light green in color, a bit like a lumpy apple of larger size. Taste - is absent. Although some find it to be with the slight taste of raspberries. Usually eaten as a green mango - with a mixture of salt, pepper and sugar. Inside the fruit contains many small and very hard seeds, which are not to be eaten. Usually the salesman would cut them off and throw them away, but if someone wants to eat them - you can just ask to leave the seeds inside the fruit. In Thailand, it is one of the most popular fruits. The fruit contains protein, fat, calcium, phosphorus, iron, fruit sugar, vitamins A and C (5 times more than orange) and cellulose. You do not need to peel guava, as its skin is very useful - it improves digestion and helps the heart, and unlike the imported apples is not covered with wax. The taste of the flesh is similar to a pear. Juicy, firm and sweet pear. All seeds are better be cut out and thrown away, otherwise there is a risk of breaking a tooth. This bright green "apple" can be purchased at fruit carts of street vendors, as well as in a supermarket, where it is usually sold already cut, packed on the substrate. Be careful in supermarkets there is a chance to get a slightly stale guava, which gradually begins to "ferment"! In Malaysia, we saw a soaked in sweet syrup guava but this time it was not green but pink. And the fruit was not round but elongated. It's just another kind of guava, which was just as well soaked in sweet syrup. It was a little more sweet and soft. But no matter how I tried I could not find a difference as well as trying to love eating this fruit in its natural form. I can and even love eating only the one with the syrup. - Santol, or Graton (in Thai). Though it can hardly be related to the apples, but I'll take the risk and put it into the same category. Fruit is of beige or brown color, the size of a large apple or orange. The thick rind covering the pink flesh (after cleaning the skin with a knife, it gets dark very quickly, as the apple gets dark due to its high amount of iron. The rind contains latex. When split Santol reminds mangosteen. Therefore it is also called "wild mangosteen" or "false mangosteen". However, apart form the seeds coated with pulp there is nothing more there that would remind you of the mangosteen. The fruit has a sweet and sour, refreshing, slightly astringent taste. Closer to the bone it gets more sweet. Santol seeds are not to be eaten, because it can lead to intestinal disorders. Thais usually eat that fruit with a mixture of sugar salt and pepper, which is sold right there at the market in fruit tent. Also it is widely used to make jams, jellies, marmalades and dessert, for which the fruits are soaked, sprinkled with sugar syrup and served with crushed ice, as well as alcoholic beverages. We somehow did not like it very much, but perhaps it should be given a second chance. The combination of salt, sugar and pepper helps to reveal the taste of the sour or neutral fruit, so if you've never tried to eat Thai fruits (not all, but those that are sold with this set) – you should definitely try it! Suddenly you might even like it. Also there are apple-melons which are the product of a selection and human creativity. Read more about this miracle fruit in the article about melons.